We provide ship-helicopter operating limits (SHOL) analysis, ship motion analysis, handling qualities analysis, simulation, optimisation and mathematical modelling for both defence and commercial customers. The continued enhancement and application of dynamic interface simulation programs form the basis of our ship-helicopter interface analysis capability. 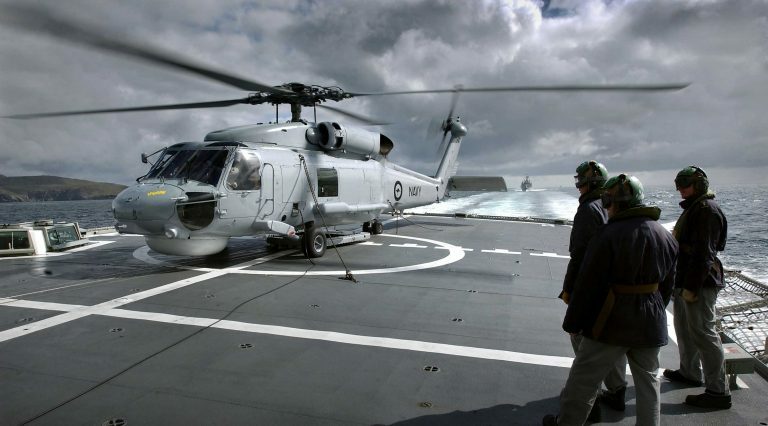 Our expertise has enabled us to be selected as a preferred supplier of helicopter-ship analysis services, procurement advice and risk assessment to various Australian Defence agencies, foreign navies and commercial organisations. 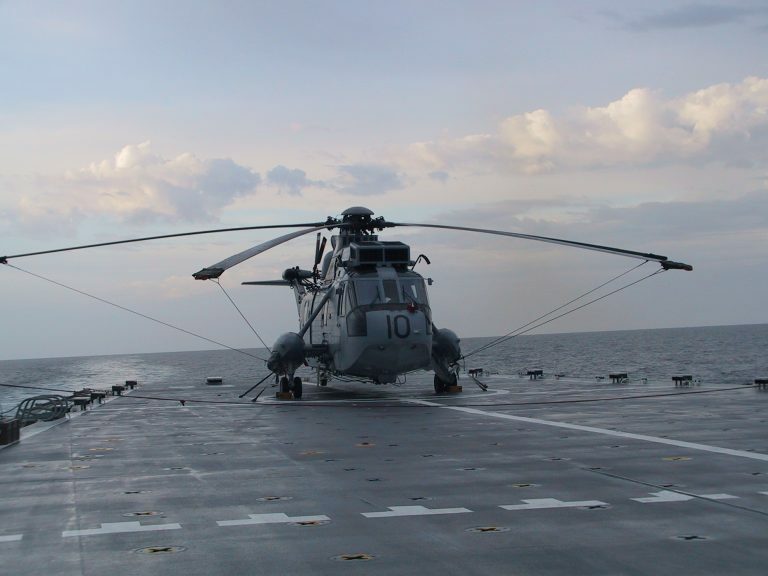 Ship motion limits are required for the safe conduct of helicopter operations at sea, particularly prior to a FOCFT. At the evaluation stage a prediction of sea state capability as well as the potential risk are vital to ensure that adequate capability can be achieved. Significant lashing loads can be imparted to a helicopter in high sea states. We can simulate the effects of various types of lashing schemes and lashing types. Sensitivity plots can be produced to assess scheme robustness and susceptibility to catastrophic failure. Through this process, a lashing scheme can be tailored to maximise sea state capability. Although helicopter manufacturers often recommend a scheme, in practice it can be very difficult to achieve due to limited deck tie down points or hangar space. AVT has conducted analysis for a range of helicopter types including MRH90/NH90, Black Hawk, Seahawk, Sea King, Lynx, Squirrel, Chinook and Seasprite and A109. In rough seas helicopters can move significantly resulting in potential safety issues and airframe damage. AVT can determine the dynamic clearance of a helicopter for a range of conditions. Any number of critical points can be considered. SHOL limits, an estimate of sea state capability and an estimate of the likely collisions per hour can be derived. Simulation mitigates the risk of structural interference and enables operators and ship builders to optimise hangar space and multiple helicopter separation. It also helps define maintenance procedures. Significant loads may be imparted to the helicopter and deck during landings, particularly in high sea state conditions and degraded conditions. AVT can estimate loads transferred through the undercarriage and helicopter as well as the flight deck for a wide range of ship motion and helicopter ascent conditions, accounting for the motion of the deck, helicopter attitude, descent and drift rates. Our software also models rotor dynamic and aerodynamic effects and control input. Good handling qualities in the maritime environment is crucial. The combination of high sea state conditions, turbulent airflow over the deck and degraded visual cues make it extremely dangerous and challenging. AVT personnel have conducted detailed ADS-33E-PRF helicopter simulation fidelity qualification for DST as well as UAV gust response analysis in the shipborne environment. Being directly involved in FOCFT activities, AVT has a good understanding of the challenges faced when operating VTOL aircraft and UAVs in the maritime environment, as well as the limiting factors influencing Ship Helicopter Operating Limits (SHOLs). The development of accurate ship motion models and the capability to analyse ship motion data is a key requirement for the analysis of helicopter-ship interface related problems. AVT a has a good understanding of ship motion modelling having worked closely with the Directorate of Navy Platform Systems (DNPS). AVT has also developed detailed ship motion models for clients as well as performed embarked sea trial ship motion validation. Verification and validation is an integral part of simulation particularly when the software is considered safety critical. AVT does its utmost to verify and validate our helicopter-ship codes and helicopter models. Manufacturers’ drawings and data are used to accurately establish undercarriage kinematics and tyre and oleo stiffness and damping component models. Where possible, standalone simulated drop tests are performed to validate the response of the undercarriage. Where correlation is inadequate, optimisation is applied to tune the model. AVT has the unique ability to operate our simulation codes in real time whilst on the ship enabling us to compare the helicopters response directly. Our capability extends to being able to tune our models whilst embarked. This innovative feature is unique and unparalleled. There is simply no better way to validate the software.